Victoria Falls River Safaris offers you an excellent, personalized and environmentally friendly upper river safari fishing experience. The specifically designed propeller-free safari boats have the unique ability of crossing the numerous rapids along the upper Zambezi River comfortably, and exploring the islands in shallow water. Guests or SpectatorsNon-fishing partners are welcome to join the river safari experience, special rates apply. Return transfers to accommodation venues in the Livingstone area. 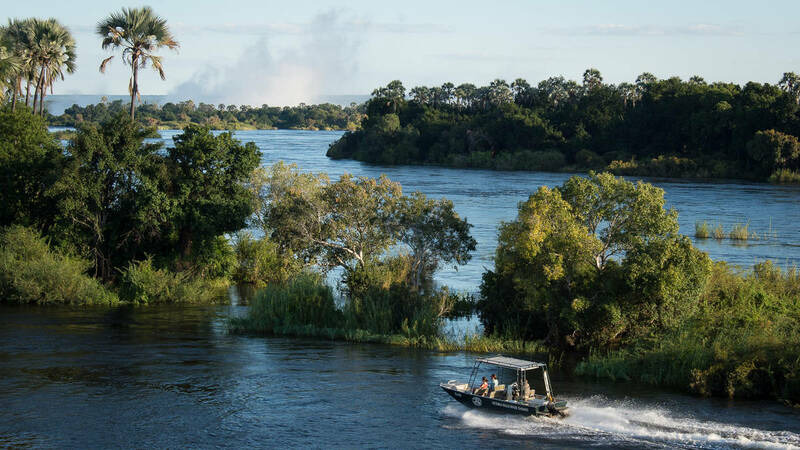 At 07h30 Sun International residents are collected by boat at the Royal Livingstone deck, and a road transfer will collect guests from accommodation venues in Livingstone town. Departure is at 08h00 from the Royal Landing Jetty for an exciting morning’s fishing on the Zambezi. Both trips return at 12:00. We supply all fishing equipment and tackle. A standard replacement fee will be charged for all lures lost by the angler. With over 75 species in these waters, you can’t go wrong with a fishing excursion on the Zambezi River. It offers one of the most exciting and challenging experiences for avid anglers: an opportunity to catch the Tiger Fish. Rated by many sports anglers as the finest freshwater fighting fish in the world, this powerful and swift predator is sure to give you a run for your money. The fishing starts at Kalai island about 9 km above the falls. We then move downstream between the islands looking for the best spot where the fish are found. Non-fishing partners are welcome to join the river safari experience, special rates apply.